A cheeky grin and a familiar chuckle spoke volumes about how excited Jurgen Klopp is about his new no.8. 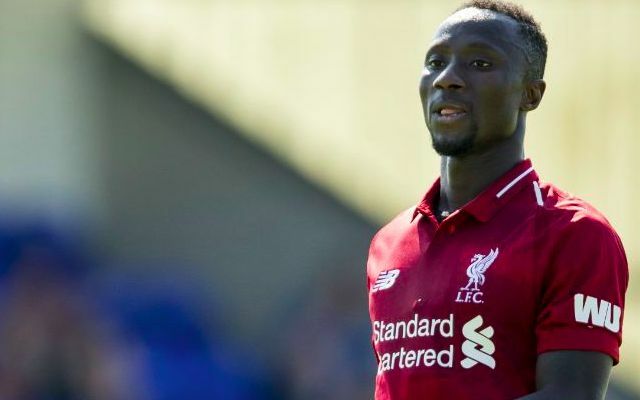 The Liverpool boss got to see Naby Keita in action for the first time since his arrival on Saturday as his side cruised to a 7-0 friendly win over Chester. Keita was introduced as one of 11 half-time changes, meaning there was no early glimpse of a partnership with fellow summer signing Fabinho. A string of bright touches and early evidence of his pressing expertise made for an encouraging debut for one of the most highly-anticipated signings in Liverpool’s recent history. Klopp talking after the 7-0 win against Chester…already working hard on preparing us right. A perfect demonstration of Keita’s compatibility to Klopp’s system came in the 54th minute when he forced a mistake from the Chester defender to put Daniel Sturridge clean through on goal for his first of the game. There were immediate signs of the intensity in his ball retrieval and ambition to break the lines in the final third that warranted Liverpool’s eager efforts to secure his services last summer. With the defensive foundations of Fabinho behind him, the 23-year-old could prove a monumental boost to Klopp’s front three next season.